BV/S is calculated as total equity minus preferred stock, divided by shares outstanding. Theoretically, it is what shareholders will receive if a company is liquidated. Total equity is a balance sheet item and equal to total assets minus total liabilities. 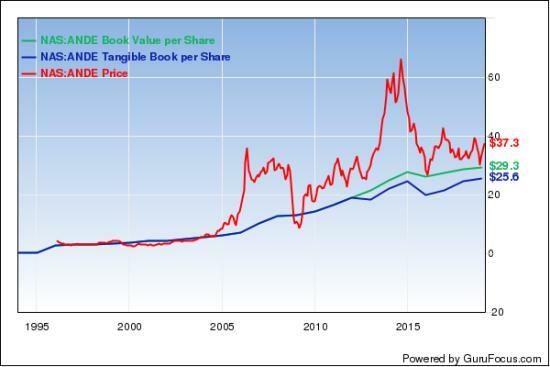 Since the BV/S may not reflect the company's true value, some investors check the tangible book value to confirm their investment ideas. Warning! GuruFocus has detected 4 Warning Signs with ABEV. Click here to check it out. 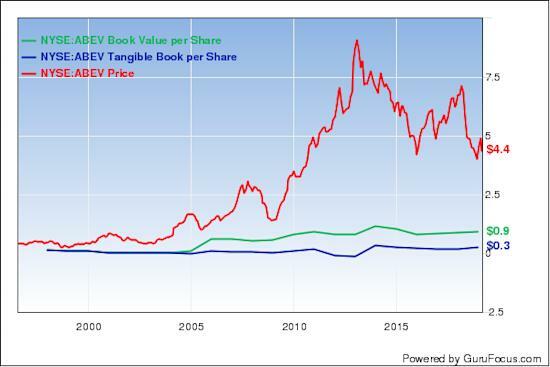 The BV/S of Ambev SA (ABEV) has grown 11% over the last 10 years. 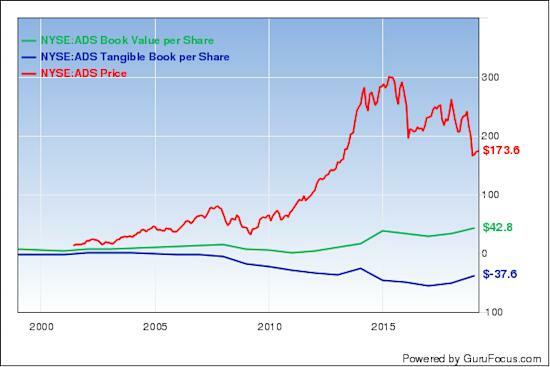 The price-book ratio is 4.84 and the price to tangible book value is 9.4. The company, which manufactures non-alcoholic and non-carbonated products, has a $69.76 billion market cap. 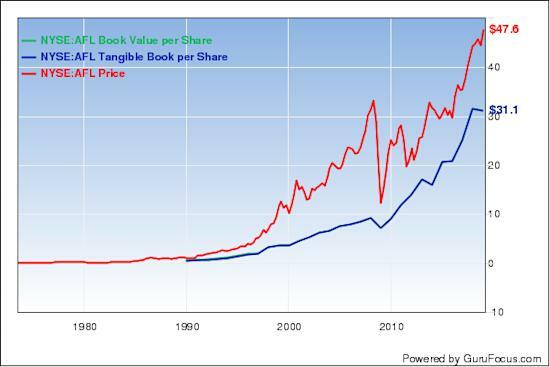 According to the discounted cash flow calculator, the stock is overpriced by 97% at $4.36. The share price has been as high as $7.43 and as low as $3.77 in the last 52 weeks. As of Tuesday, the stock is trading 41.18% below its 52-week high and 15.92% above its 52-week low. The price-earnings ratio is 24. Ken Fisher (Trades, Portfolio) is the company's largest guru shareholder with 0.18% of outstanding shares, followed by Ken Heebner (Trades, Portfolio) with 0.06% and Jim Simons (Trades, Portfolio)' Renaissance Technologies with 0.04%. Alliance Data Systems Corp.'s (ADS) BV/S has grown 37.50% over the past decade. The price-book ratio is 4.06. The company, which provides loyalty and marketing solutions, such as private-label credit cards, has a market cap of $9.2 billion. According to the DCF calculator, the stock is undervalued and is trading with a 60% margin of safety at $173.68. The share price has been as high as $250.27 and as low as $142.58 in the last 52 weeks. As of Monday, it is 30.61% below its 52-week high and 21.81% above its 52-week low. The price-earnings ratio is 9.91. 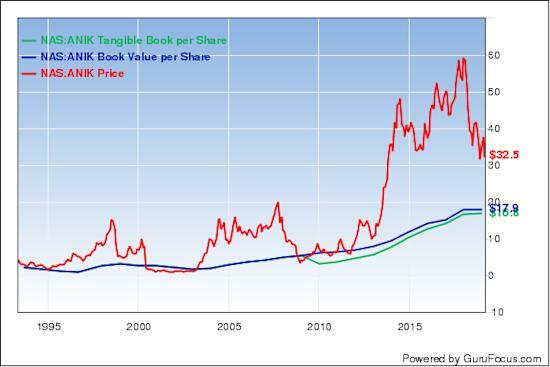 Aflac Inc.'s (AFL) BV/S has grown 15.30% over the past decade. The price-book ratio is 1.58. The insurance company has a market cap of $37.13 billion. According to the DCF calculator, the stock is undervalued and is trading with a 19% margin of safety at $49.38. The share price has been as high as $49.71 and as low as $41.45 in the last 52 weeks. As of Tuesday, the stock is trading 0.93% below its 52-week high and 18.82% above its 52-week low. The price-earnings ratio is 13.16. With 0.22% of outstanding shares, John Rogers (Trades, Portfolio) is the company's largest guru shareholder, followed by the Smead Value Fund (Trades, Portfolio) with 0.17% and Pioneer Investments (Trades, Portfolio) with 0.08%. 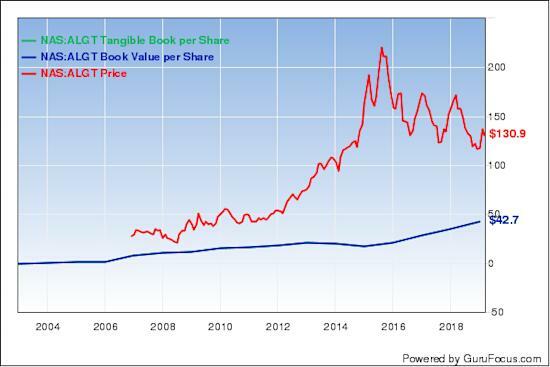 The BV/S of Allegiant Travel Co. (ALGT) has grown 11.30% over the last 10 years. The price-book ratio is 3.06. The travel services provider has a market cap of $2.13 billion. According to the DCF calculator, the stock is undervalued and is trading with a 54% margin of safety at $130.58. The share price has been as high as $181.45 and as low as $98.18 in the last 52 weeks. The stock is currently trading 28.29% below its 52-week high and 32.53% above its 52-week low. The price-earnings ratio is 13.04. With 3.70% of outstanding shares, Diamond Hill Capital (Trades, Portfolio) is the company's largest guru shareholder, followed by First Pacific Advisors (Trades, Portfolio) with 2.69%, Simons' firm with 1.26% and the FPA Capital Fund (Trades, Portfolio) with 0.71%. Andersons Inc.'s (ANDE) BV/S has grown 8.90% over the past decade. The price-book ratio is 1.26. The agricultural company has a market cap of $1.22 billion. According to the DCF calculator, the stock is overpriced by 135% at $36.66. The share price has been as high as $41.70 and as low as $27.62 in the last 52 weeks. The stock is currently trading 10.17% below its 52-week high and 35.63% above its 52-week low. The price-earnings ratio is 25.44. Simons' firm is the company's largest guru shareholder with 1.73% of outstanding shares, followed by Barrow, Hanley, Mewhinney & Strauss with 0.32% and Richard Snow (Trades, Portfolio) with 0.12%. The BV/S of Anika Therapeutics Inc. (ANIK) has grown 14.40% over the last 10 years. The price-book ratio is 1.74. The pharmaceutical company has a $454.77 million market cap. According to the DCF calculator, the stock is undervalued and is trading with a 12% margin of safety at $32. The share price has been as high as $54.88 and as low as $28.54 in the last 52 weeks. As of Tuesday, the stock is trading 41.69% below its 52-week high and 12.12% above its 52-week low. The price-earnings ratio is 24.96. With 1.85% of outstanding shares, Simons' firm is the company's largest guru shareholder, followed by Fisher with 0.52%, Barrow, Hanley, Mewhinney & Strauss with 0.51% and Hotchkis & Wiley with 0.45%.